Fans are painting the town red and green in the hours before kick off. Leprechauns, dragons, sheep, giant pints of Guinness.... more leprechauns ... and even St Patrick himself were spotted in the throng. 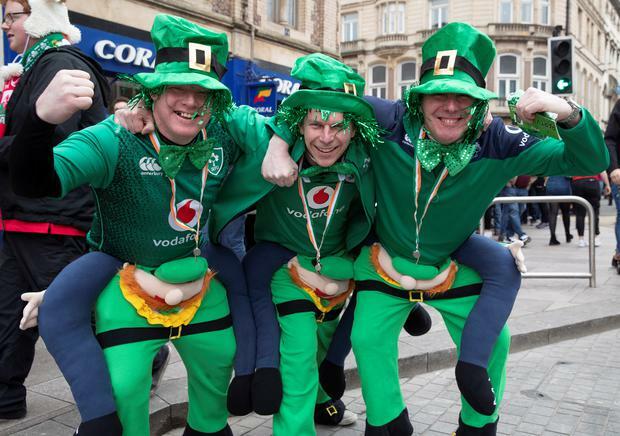 An air of quiet anticipation has gripped both sets of supporters, with all fully aware that this is the game that could decide Six Nations 2019. It will also help shape the legacies of coaches Joe Schmidt and Warren Gatland who are both at the helm for their final Six Nations games. Adrian O'Shea and Ian Coughlan from Cork were conscious of how tight it could be. While wearing their best green suits, they'd seen a computer model that predicted the game would be decided by just two points. The bookies have it at just one, in Wales favour. Aoife Shanahan however described herself as "confident" of an Irish victory. Hailing from Thomondgate in Limerick, she is a veteran of many Munster matches and has travelled to Cardiff six times. The atmosphere inside the Principality Stadium would not intimidate her. Others were less sure, and Hazel O'Connor from Clare, Co Offaly even admitted she was unsure of how hard an Irish win would be celebrated "because it could hand England the title". "I've got a lot of Welsh friends," she added. Further down Westgate Street in the shadow of the stadium, Tom Wells and friends were pragmatic. He'd been to Cardiff once before as a youngster when the stadium first opened, but this was the big one. "If Wales win we will still have a good night," said Tom, from Moira in Co Down. Meanwhile a group from Kilkenny were trawling the area for any spare tickets. "They're just so expensive," bemoaned Shona Croke. And no certainty just yet, of who will be left holding the glittering prize.